Ascent Protein Powder is instantized for better mixing. Add 1 scoop of powder to your beverage and stir/shake/blend to your liking. For the ideal texture, use 10 to 12 fluid ounces of beverage. Use this product as a food supplement only. Do not use for weight reduction. Do not use as a sole source of nutrition. Intended for healthy adults over the age of 18. Did you know the primary period for muscle loss is while you're sleeping? LOW CALORIES, CARBS, SUGAR, & FAT PER SERVING. We are the protein company that you’ve never heard of. Based in Denver, Colorado and family-owned for over 60 years, we’ve been making high-quality whey protein for decades. Our experience and scientific advancements made us a world leader in producing some of the purest and most trusted whey proteins for the leaders in Sports Nutrition. 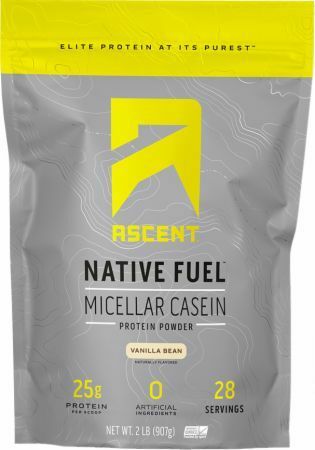 Over the past five years, we’ve been working on our biggest breakthrough yet…Ascent Native Fuel protein. Native Fuel is made with native whey, the new benchmark in whey protein purity. Native whey is the least processed protein available today because it’s filtered directly from high-quality milk. Native whey also contains naturally higher levels of leucine, the key amino acid for stimulating muscle protein synthesis. No further processing, no bleaching, no dyes and no artificial ingredients. We are able to do this because unlike other Sports Nutrition companies, we don’t buy any of our proteins. We buy milk from trusted dairy farmers and make 100% of our own protein, in our own facilities and carefully control this process. Sounds easy? It isn’t. It’s breakthrough. Your secret to results is simple: hard work. You’re not looking for gimmicks. You realize it’s the daily commitment to not just push through an extra rep or mile, but also to the kind of fuel you’re putting in that helps you reach new goals. Pure protein for recovery & repair is essential and Ascent is there to help. Your best is still ahead.